H.P. Lovecraft (1890-1937) is commonly regarded as the leading author of supernatural fiction in the 20th century. He is distinctive among writers in having a tremendous popular following as well as a considerable and increasing academic reputation as a writer of substance and significance. This encyclopedia is an exhaustive guide to many aspects of Lovecraft’s life and work, codifying the detailed research on Lovecraft conducted by many scholars over the past three decades. It includes hundreds of alphabetically arranged entries on Lovecraft and presents extensive bibliographical information. As Lovecraft’s renown continues to ascend in the 21st century, this encyclopedia will be essential to understanding his legacy and writings. An H.P. 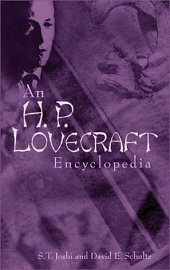 Lovecraft Encyclopedia. By S.T. Joshi and David E. Schultz. Westport, CT: Greenwood Press; 2001; ISBN 0-313-31578-7 (hardcover). New York, NY: Hippocampus Press; 2004; ISBN 0-9748789-1-X (paperback).